This is my journey. It didn't begin when I stepped on board Apollo II on July 6, 1969. 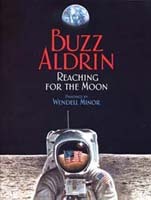 It began the day I was born - Edwin Eugene Aldrin Jr., whom everyone called Buzz. Becoming an astronaut took more than education, discipline, and physical strength. It took years of determination and believing that any goal is possible - from riding a bike alone across the George Washington Bridge at age ten to making a footprint on the Moon.